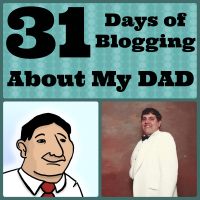 Here we are at Day 13 of the 31 Days of Blogging Challenge. Today I kept getting tagged and messages about this article that was in the paper. When I first skimmed the articled I couldn’t figure out why I was tagged and when I did a search for my name I didn’t find anything…well after more carefully reading the article I found my dad’s name and our last name was spelled wrong….OOPS. The school recently got a new principal and my dad’s name was mentioned. You can go here to read the article.